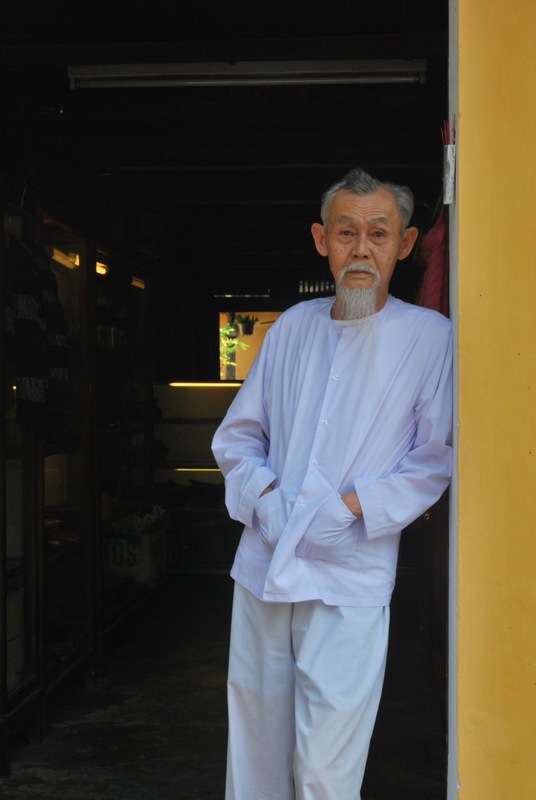 We had two nights in Hoi An, a beautiful World Heritage city on the central coast of Vietnam. 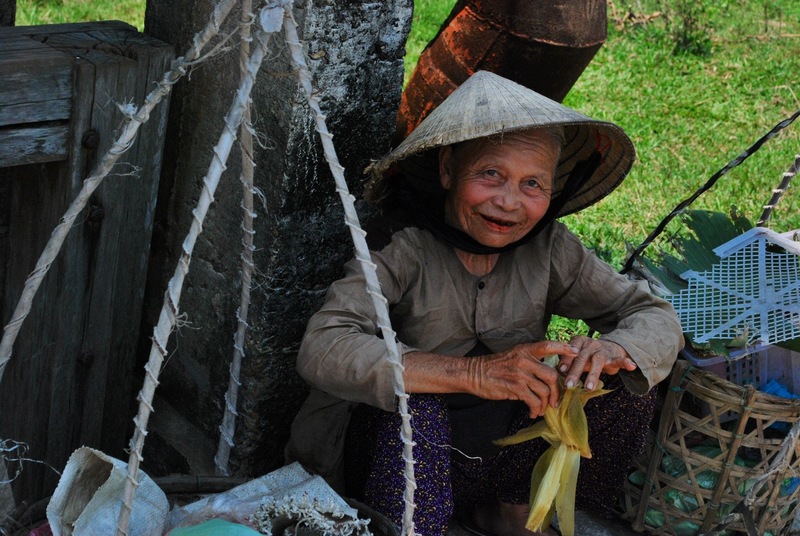 Hoi An is small, just 6 square KM, making it easy to explore on foot or bicycle. It kind of has everything – lots of history with old bridges, temples and traditional houses you can visit, a beautiful riverfront lined with old French style buildings, an amazing street food scene and two lovely beaches that you can cycle to in 10-20 minutes. 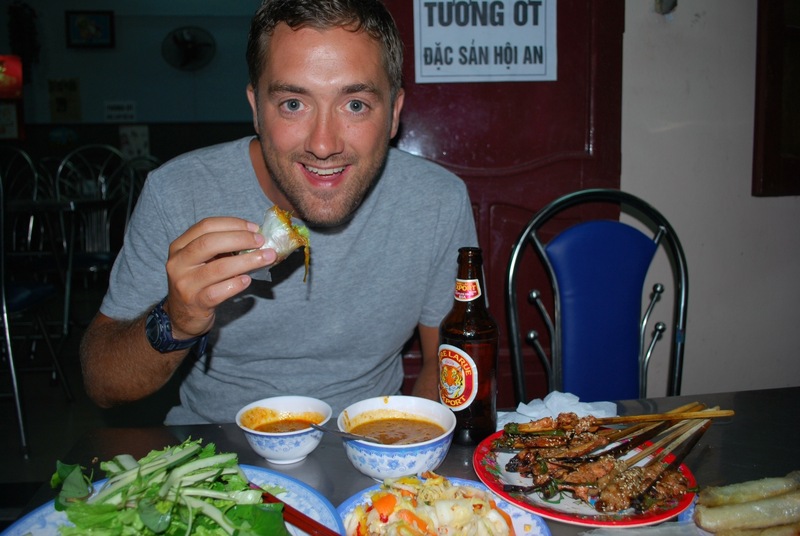 We stayed in a really amazing guesthouse called Hoang Trinh. We had read great things about it on tripadvisor but it really did surpass our expectations. When we arrived we were sat down for some iced tea and coconut macaroon cake while the receptionist chatted to us about the city and marked some places on a map for us. We immediately felt at home, little touches like that really do make all the difference! We started off with a walk around the old town, we crossed the ancient Japanese covered bridge, looked at lots of the old buildings and sat by the river with a coffee. This dapper gentleman posed for us in the doorway of his shop. That evening we went to a street food restaurant called Hi, it was brilliant value and delicious. We tried some traditional dishes such as White Rose – dim sum style dumplings with shrimp, Cao Lao – beef noodles in a delicious sauce, and some duck spring rolls. We washed the food down with some ice cold beer that the restaurant buy from a shop just across the road. 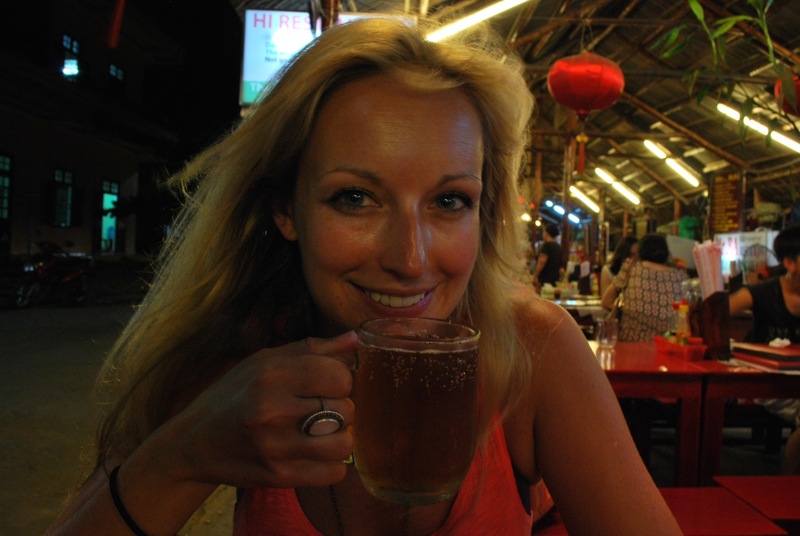 The beer in Hoi An is mainly Bia Hoi, this is fresh beer brewed daily, it is delicious and REALLY cheap. By cheap we mean 10p per beer. Jack is in heaven. I love it too because it’s less fizzy than bottled beer and has a lighter taste. Bia Hoi is sold on every corner, you can sit down on teeny plastic chairs with the locals and have a few beers for less than 50p. 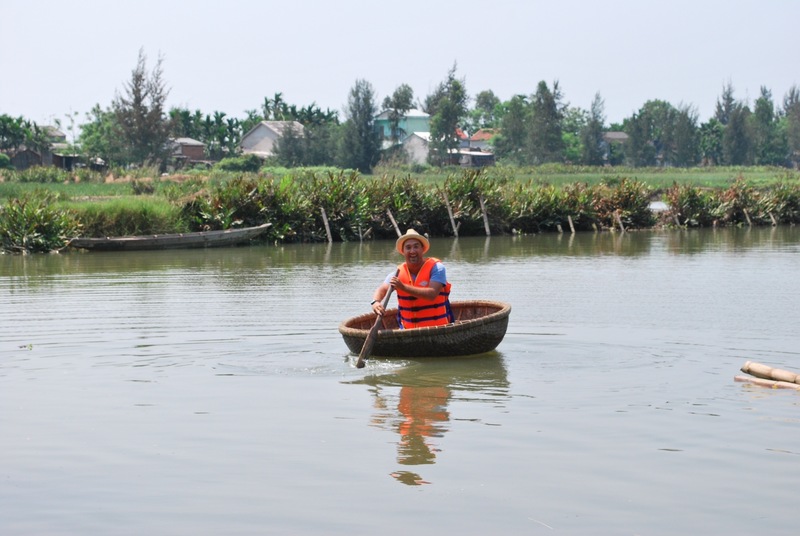 The next day we went on a bicycle tour of Hoi An and some nearby islands on the river. There were 5 of us in our group and everybody was absolutely lovely – we were with a great Welsh couple and a Canadian-French girl. Our guide, Be, was brilliant. Her English was amazing and she was very funny – she was so great that we invited her for a drink at the end of the tour with all of us. 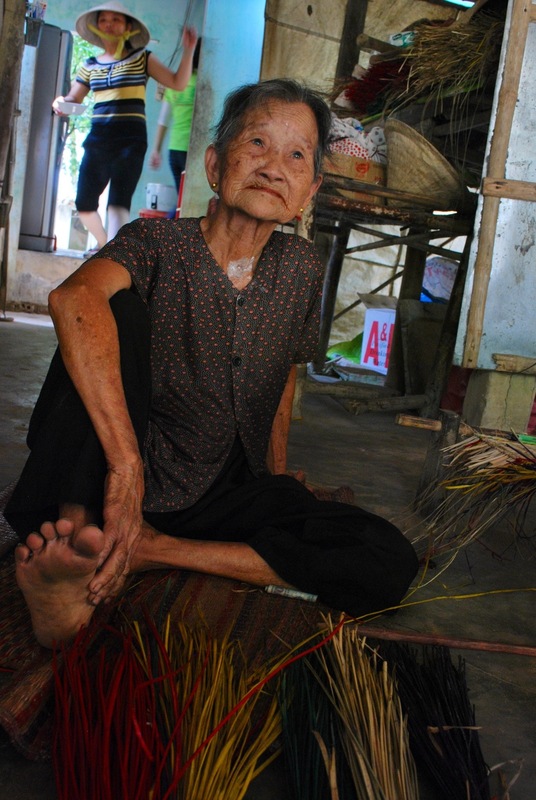 We started off cycling through the busy market of Hoi An – as usual Jack was snapping away with the camera and captured some great shots. The market is pretty typical – lots of fruit and fish for sale and extremely busy with moped and bicycles all over the place. 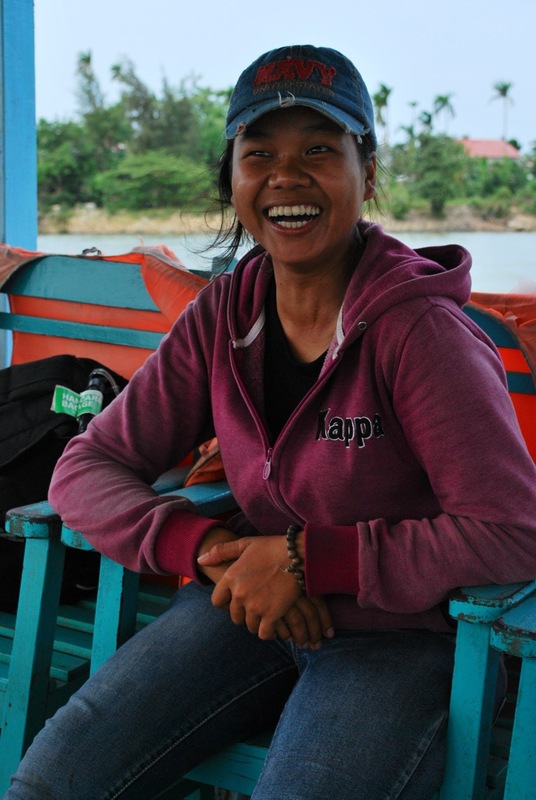 We caught a local ferry with our bikes to a smaller island where around 200 people live. The roads were dusty and quiet and we cycled past awesome countryside and farmland – corn, lemongrass and peanuts were all growing here. 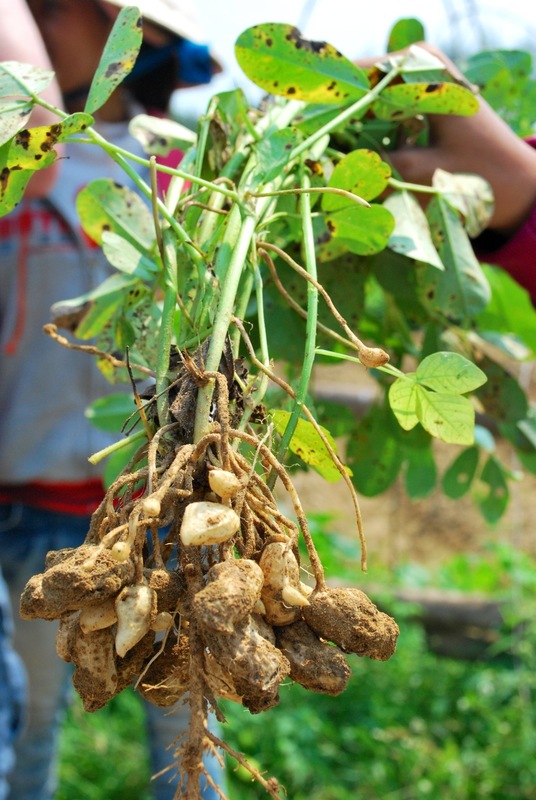 For some reason I was particularly surprised by the peanuts, I had no idea they were dug out of the ground – I though they grew on trees! 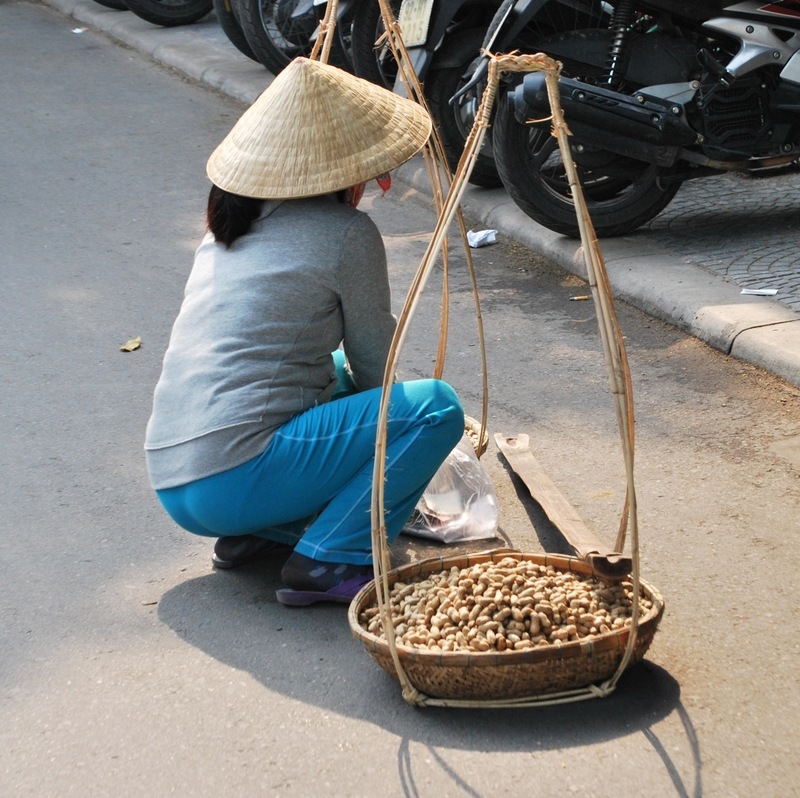 Once the peanuts have been dug up they are then dried in the sun and roasted before selling. 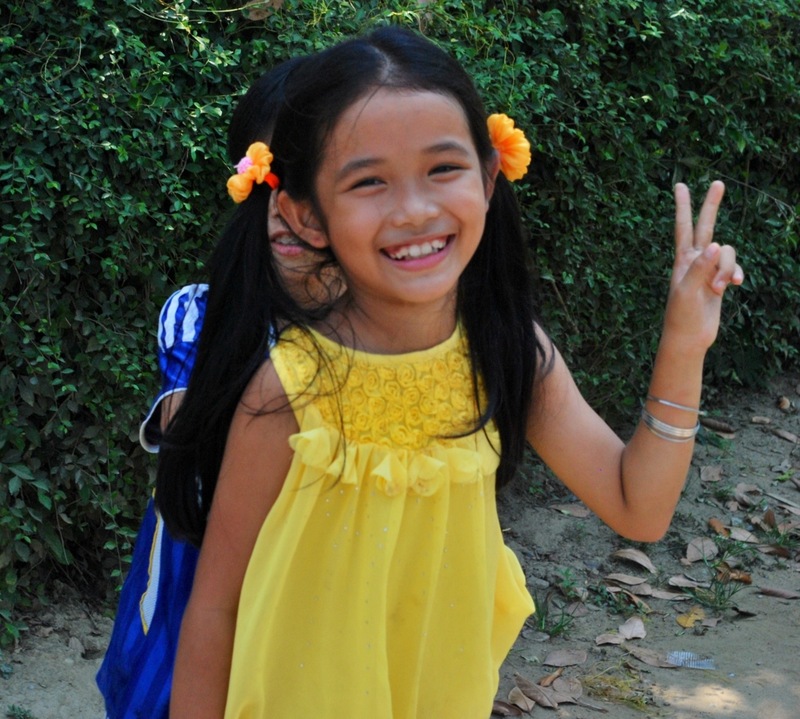 We cycled through the villages where once again the children were very excited to see us! Jack took some great photos on the ride, pretty impressive as we was cycling along at the same time. We learnt a lot on this trip, we saw huge blocks of ice being made – these are then chopped up with a saw and sold several times a day to markets; we saw huge fishing boats being built as well as the smaller bowl boats that are weaved from bamboo, we visited a pearl engraving workshop and saw some beautiful pieces that sadly we couldn’t afford and we watched traditional sleeping mats being woven. Here is Jack trying out a bowl boat. Interestingly, these were introduced in response to the French taxing bigger fishing boats. By making a bowl boat the Vietnamese people could claim this was simply a big bowl and not a boat, avoiding paying tax. They are pretty hard to steer – I went round in circles and needed to be rescued! We walk in, sit down and are offered beer. We order two cans of 333 which appear immediately. Suddenly a huge plate of fresh green herbs and salad leaves are placed down on the table with rice pancakes and a mountain of vegetables. OK, we hadn’t realised we didn’t need to order, and there was no mention of price. Oh well! By now there were about 7 dishes on the table, shrimp spring rolls had been added as well as a huge plate of skewered pork. A pile of omelettes containing beansprouts also appeared along with some dipping sauces. Sensing we may not have done this before the waiteress rolled us each a pancake, filling flat rice paper with leaves, veg, omelette, a spring roll and finally pulling off a whole skewer of pork. She squished it all together to create a tight pancake wrap which she thrust in our face exclaiming “Dip and EAT”.We ate and it was delicious, although a bit of a mouthful! Eventually, when we were completely stuffed we said no more! After this we walked to the river. 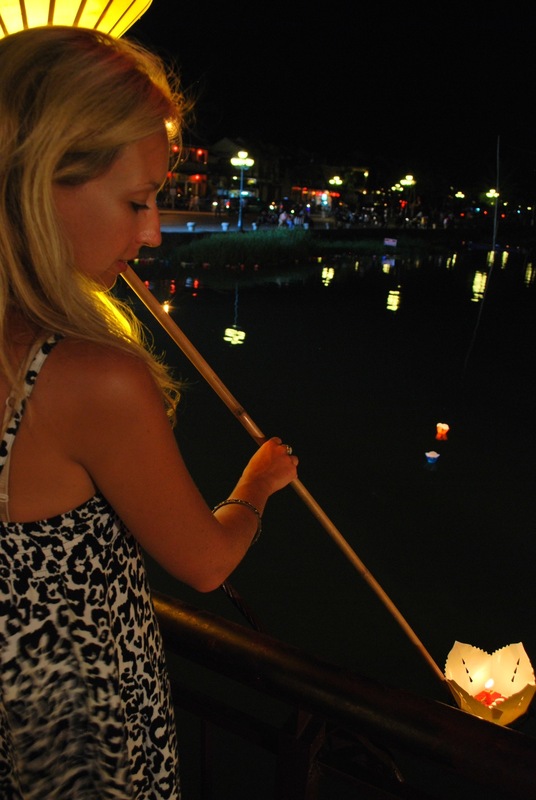 It was the 14th day of the month on the lunar calendar which is followed in Vietnam, and in Hoi An this means lights out. The city is lit by candlelight for the evening and mopeds are banned in the centre – everything is much more peaceful and the river looks beautiful. We bought two candle lanterns from some girls on the bridge which we lowered into the river before making a wish, all of the little lanterns floating along make a beautiful sight. The next morning as we left our guesthouse we were given presents to take with us, a small silk bag and some traditional Vietnamese purses – what a lovely touch! 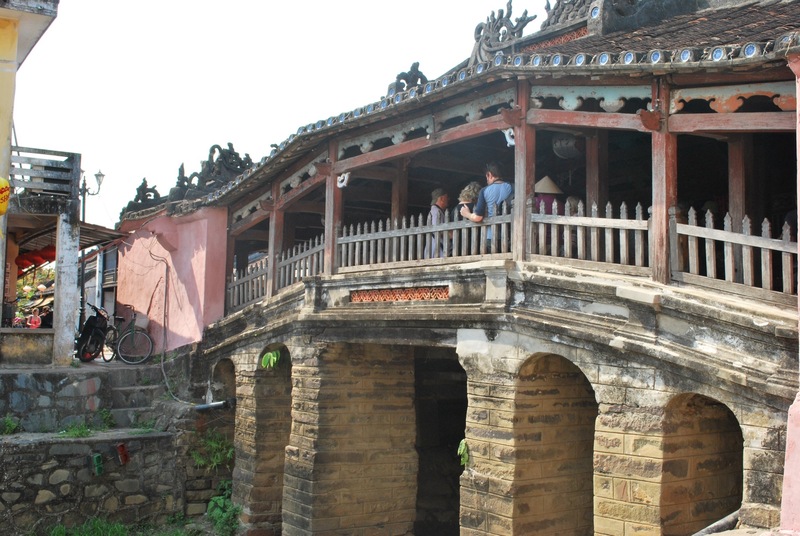 We took a taxi to Danang where we would travel to the ancient city of Hue. P.S. I decided to leave out the bit where we met some fun people, drank far too much and Jack had his phone stolen by a motorbike taxi driver, ‘cos it just didn’t fit with the nice story. But it happened. 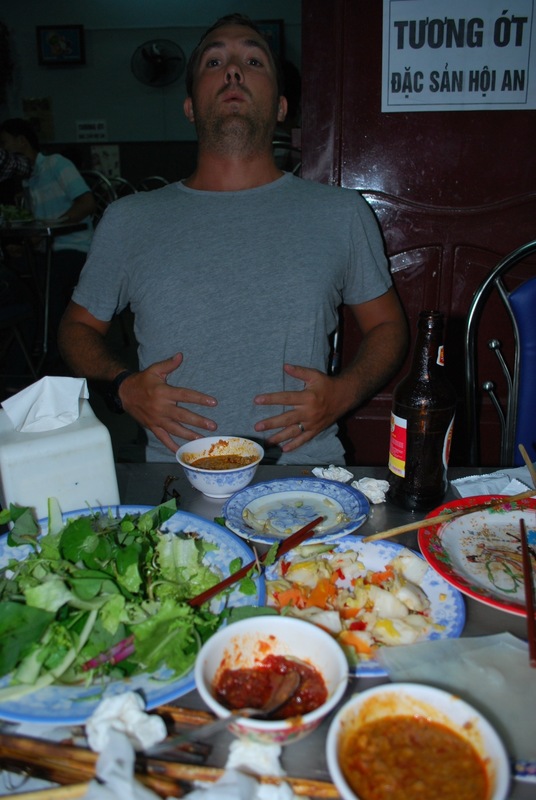 I also had such a bad hangover that I cried on the train to Hue because I felt so sick. I even said to Jack at one point “My eyeballs are shaking, I don’t know what’s wrong with me!” Anyway, I survived and my eyeballs are still in my head. You live and learn! We are the Welsh couple that you met in Hoi An. So sorry to hear about Jack having his phone stolen (and your hangover from hell). Hope it wasn’t anything to do with our night out! If you want to contact us, our email is mjdecorating@hotmail.co.uk. Best wishes for the rest of your holiday!